Love Potions, Passion, and My (Current) Favorite Cookbooks | Real. Fresh. Paleo. I once received the following love-life advice from a psychic (so you can take it for what it’s worth). When you find someone you really like, and want to be sure they return the sentiment, cook them a stew. As you chop and assemble the ingredients, concentrate on putting love into it, just like you do the meat and vegetables. If it is meant to be, the other person will eat the meal and wham, bam, thank you ma’am, true love is born. One part dinner, one part love potion. While I can’t vouch for the efficacy of the technique in landing a spouse, there is a little nugget of truth there. What brought to mind my unusual psychic encounter and the subsequent contemplation of food and passion? I was trying to figure out why I loved my favorite cookbooks. Have you ever read a cookbook cover to cover? I have, but not very often. The cookbooks that I have actually treated like a book rather than a recipe reference are the ones I keep coming back to. What makes them so good? It’s the passion for food. The zest for, well, zest, that differentiates the ordinary cookbook compiler from the great cookbook writer. Anyone can throw together a book of recipes. Put a good index in it and if someone needs to know how to bake a bundt cake, they’ll know where to go. Add some good pictures and you may catch my attention a little longer. Take the time to tell me why something works, what you did wrong or really liked, why a specific recipe is special to you — in short put yourself into it — and I know that those are recipes I want to make. Those are the ones I always go back to. So what are my current favorites? I’ll list three below. One I have been using for over a year regularly. The other two are very new for me, but I already love them. 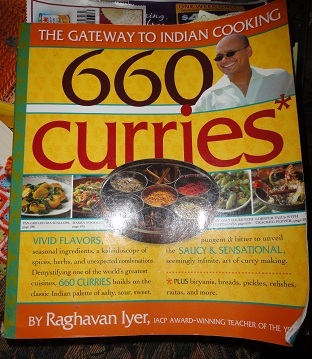 As far as I am concerned, this is a must have for anyone wanting to explore Indian cooking. You can tell by the curled cover and random post-its sticking out, that it is well-loved. The recipes are the author’s family recipes, friends’ family recipes, and old family recipes from random people he met while creating the book. These are old school Indian recipes, but the author makes them contemporary (and easy to understand for someone unfamiliar with the culture), and even includes a section of fusion cooking —- mixing his Indian heritage with his very american upbringing. The recipes are interspersed with personal anecdotes and information on the origin of many of the recipes. The multitude of spice blends in the beginning chapters alone is worth the cover price. The smell of store-bought spices has nothing on a fresh ground masala blend. I didn’t do an official count but I’d bet at least half of the 660 recipes are paleo or could be easily adjusted. I stumbled across this book by accident the other day while killing time perusing cookbooks at the bookstore. After thumbing through it for a few minutes, I knew I had to adopt it and bring it home. The beginning chapters cover the basics of roasting and talk about the different techniques for roasting and how and why each does what it does. I learned more about roasting meat and veggies after a half hour than I’ve learned in the last 38 years. It also includes sections on roasting fish, vegetables, and fruit. The recipes are fairly simple and let properly roasted food take the center stage. 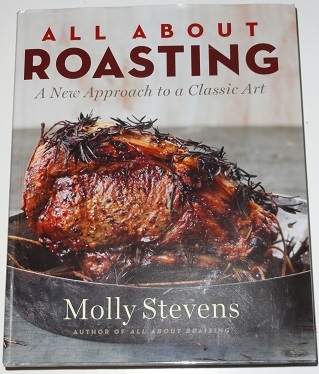 The author’s passion for roasting (and good real food in general) comes across. I wish there were photos for all of the recipes, but the photos that are there are beautiful. I’ve used a couple of techniques I’ve learned already and will definitely be pulling this out a lot. This one is hot off the presses and just came out this month. 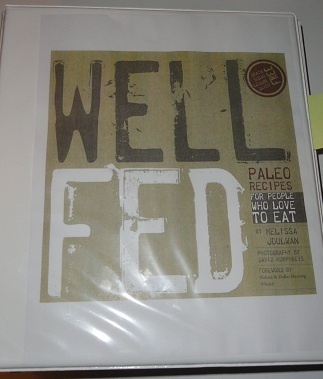 Well Fed has it all — great pictures, good recipes, and commentary that is as entertaining as it is informative. Plus the layout is fabulous. There is a “notes” section on each page (no more squeezing notes in the margins) and references for which other dishes in the cookbook go well with it. The cookbook features favorites from her website www.theclothesmakethegirl.com plus a few recipes that don’t seem to be on her site. The chocolate chili recipe I reviewed yesterday was hers. I tried the mayonnaise recipe (I’m still determined to find a good paleo mayonnaise!). I had problems getting mine to thicken properly, but the flavor was pretty good, so I’m going to work on my technique some more. I already have a number of recipes bookmarked and on my list of “must-makes” including the Moroccan meatballs and Jicama “Potato” Salad. You can download a free 30 page pdf sampler of the cookbook on her website. There aren’t many recipes in the sampler, but you get a great sampling of her writing and the full table of contents. A number of the recipes are available on her website if you want to give them a try first. The cookbook includes alternate ways of making things and suggested items to pair it with so its worth the purchase if you like what you see. There is a pdf version available as well as athe print copy. When you buy a print copy, you get a code to get the pdf copy for only $1 more. Do your self a favor and get the print copy. I bought the pdf e-book because I didn’t want to wait for shipping (I may have some impulse control issues). I’m not super happy with the pdf version because it shows two pages at a time and prints out at 11×17. It’s nice because you can see facing pages as if you are looking at the open book, but its hard to view on the screen without increasing magnification and scrolling. If thats not a problem for you, it may be a good option because it does cost half of the print price. It drove me nuts though and I ended up printing the whole thing on 11×17 paper and then cut the pages apart and punched and assembled it in a binder. Its good enough for now, but I may end up splurging and getting the shiny, pretty print version eventually. And it really is a very pretty well laid out book. Hard to believe it is self-published. This entry was posted in Ramblings and tagged cookbook. Hi, there! Thanks so much for the shout to Well Fed. I love that you’re enjoying the book — and it’s so nice to know you appreciate the design touches. Kathleen, our amazingly talented designer, really sprinkled fairy dust magic on all the pages. And yes, we wanted to keep the PDF as close to the book as possible, so it’s really optimized for the 11X17 printing — which is almost the same dimensions as the printed book. Sorry you had to free-form your own hard copy! Wishing you many happy meals with people you love! Have a great 2012!